Following the press photo leak from a couple of days back, the Verizon bound Nokia smartphone has emerged in live photos. Dubbed Nokia Lumia 822, the Windows Phone 8 smartphone is (just like the Nokia Lumia 810) yet another carrier specific version of the Lumia 820. The specs of the Nokia Lumia 822 are quite similar to the 820's, save for the presence of Verizon 4G LTE bands and the matte finish. They include a dual-core CPU, WVGA display, and 8MP camera. 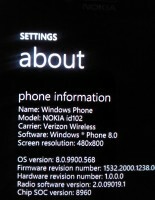 The Nokia Lumia 822 is expected to go official for Verizon any day now, so we'll be sure to keep a close eye on it.